Let me start by saying this is my all time favorite stove top macaroni and cheese recipe. We make it about twice a month and it makes enough for two nights with our family of 3. 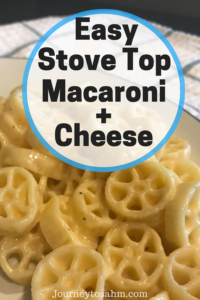 I always dreamed about creating a homemade stove top macaroni and cheese recipe my entire family loves. My 2 year old eats every single noodle on her plate and my husband always goes back for seconds. When that happens, I call that a win in my book! This recipe was inspired by Mom’s Macaroni and Cheese recipe, but we didn’t want to use Velveeta cheese. We turned this dish into a healthier-ish version opting out of the Velveeta and keeping it a stove top variety. 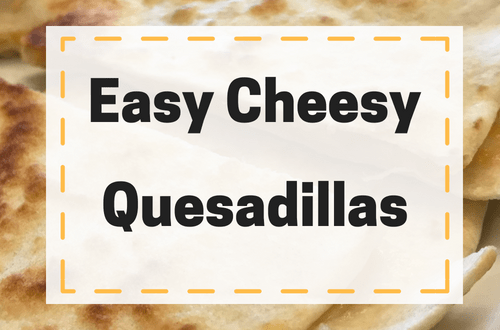 I love to make this recipe to use up the extra shredded cheddar cheese we have to avoid throwing it out. That is just one of my tips of overlapping ingredients in my 30 Minute Meal Planning for the Busy Mama post. Start by boiling a pot of water and cook pasta until al dente. 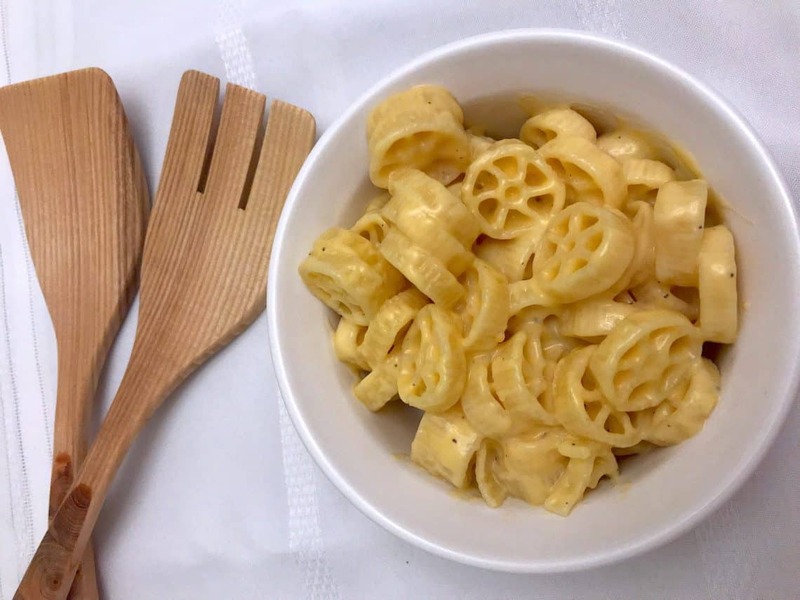 We like to use wagon wheel pasta (rotelle), but any pasta that will allow the cheese to cling to it will work (think shells, elbow, etc.). Strain the pasta. You can either do this next part while you’re making the pasta or while it’s draining. I personally love to do it while the pasta is sitting in the colander. Less dishes and only takes about 7 minutes more. Even doing them one after another, dinner will still be on the table within 25 minutes. If you don’t mind the extra pot being used or are in a rush, go right ahead and do everything at the same time. Melt the butter in the pot on med/low heat. Add flour and mix. Stir in salt and pepper until combined to make a roux. 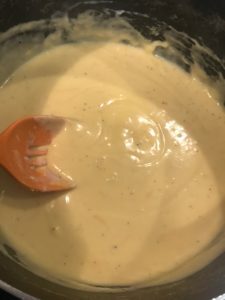 A roux is basically a thickening agent to help make a sauce. Increase to medium heat. Gradually add in 1 1/2 cups milk. I will usually add half of the milk, mix it, then add the rest and mix again. Cook until the sauce starts to thicken, usually 3-4 minutes. 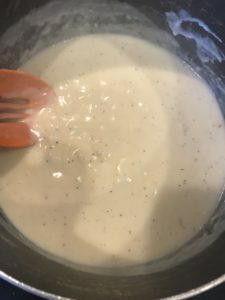 The first time I made this recipe I was amazed with how it already looked like a creamy cheese without any actual cheese in it yet! Once thickened, remove from heat and add in cheddar cheese. Stir until melted. Pour in pasta and mix well to combine. Serve immediately. 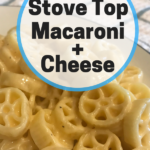 I enjoy pairing this stove top macaroni and cheese with a healthy side like Air Fried Roasted Carrots and some dinner rolls. Doesn’t that look delicious? An easy creamy stove top macaroni and cheese your whole family will love! Boil a pot of water and cook pasta per directions on box until al dente. Strain pasta. Melt butter in pan on med/low heat. Add in flour and mix. 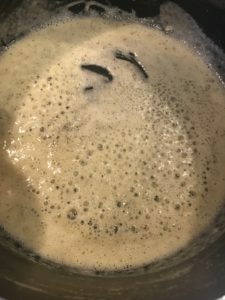 Stir is salt and pepper until combined to make a roux. Increase to medium heat. Gradually add in 1 1/2 cups milk. Cook until the sauce starts to thicken, usually 3-4 minutes. Remove from heat and add in cheddar cheese. Stir until melted. Pour in pasta and mix well to combine. Serve immediately. 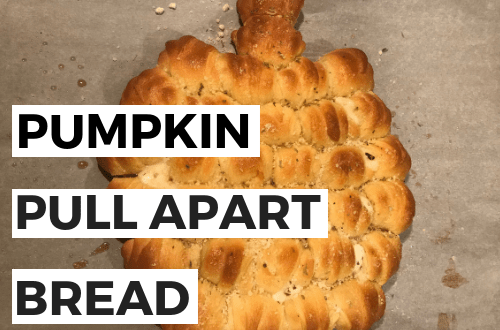 Pairs perfectly with Air Fried Roasted Carrots and dinner rolls. There is nothing like homemade mac and cheese. The box stuff just taste nasty, yuck. So easy to make mac and cheese and you can change up the cheese to suit your family or just for something different. I needed this recipe in my life! 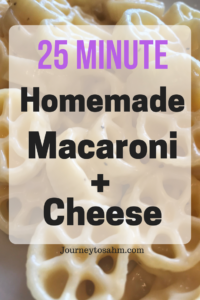 My kids love mac and cheese, of course, and this one is perfect for our busy family. They will absolutely love it Jen! 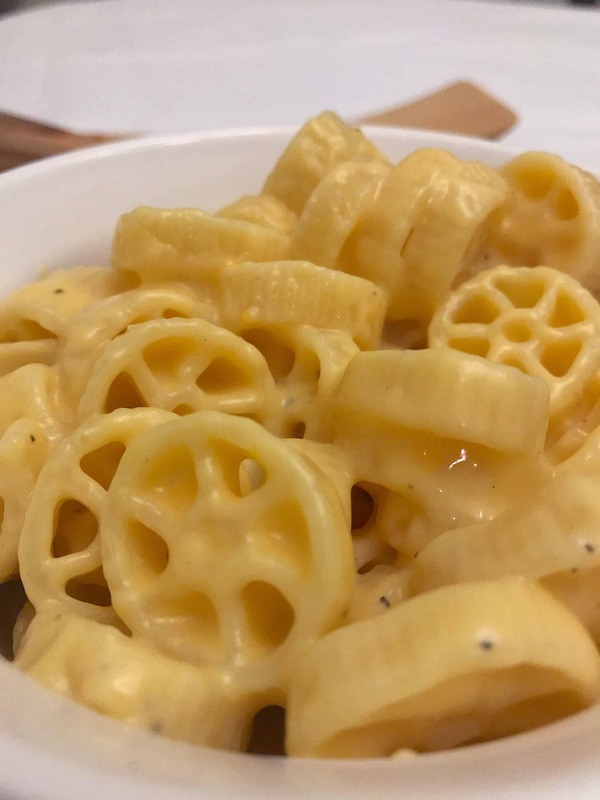 It’s something about that wagon wheel pasta that makes it taste even better to kids too. I love the simplicity of this – perfect to mix in veggies or protein, too. Yes, that would be perfect Amy! 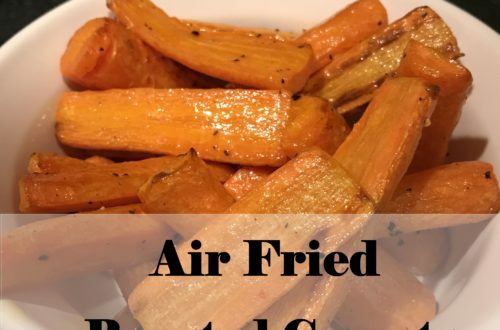 It works great as an entree or a side dish. This looks so delicious and comforting. And definitely love that you swapped out the velveeta. Going to try this! I love home made mac and cheese. This looks wonderful and so simple too! Macaroni and cheese is my Fav!! I can’t get enough. Thanks for the new idea! This looks SOOO good! I have always meant to try homemade mac & cheese, but the boxes are always so alluring. I will give this one a try because it looks so easy! Homemade is definitely worth it Laurel! I used to think making homemade would be so tough and time consuming, but it’s not! Oh my son would go nuts for this recipe! I like the idea of using wagon wheels. Trying this out for dinner tomorrow night! Let me know how it goes Katie! I’m sure he will love the wagon wheels! This looks great! My kids hate homemade baked Mac and cheese, I’ll have to try this. I really need to learn how to make mac and cheese from scratch. I don’t eat it because I don’t like cheese, but I hate the smell of the boxed stuff! I need to stop buying the boxed mac and cheese and make my own – this looks WAY tastier!! I like how easy this recipe is too. Saving to make soon. Thanks! It honestly is so easy to make! I mean we can never give up boxed mac and cheese all together, but this one just doesn’t have that “prepared” taste the box can have. This is how I make mac and cheese too! It’s really good with some chopped ham added in! What a great idea Laura! We keep ours vegetarian for me, but that is a great way to add some extra protein into the dish. I always just make it from a box, but this looks so good! I need to try homemade at some point. It’s worth it! This recipe doesn’t take much more effort than the boxed kind and it’s just that much better. I can’t wait to try this! Saved it to my dinner board. We love mac n cheese. We always mix something in it for variety – my kids love the cheeseburger mac n cheese and we have also done it with scallops -so good! I love that idea! We keep ours vegetarian for me, but I love the different varieties! I might try it with some vegan ground beef. I love mac n cheese but I always bought the one in a box. Glad I found a recipe where it’s homemade. This looks delicious Samantha, thanks for sharing! 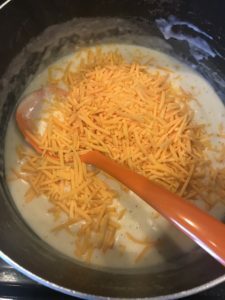 I have tried several mac and cheese recipes and for some reason my kids don’t like any of them! So frustrating : ) Can’t wait to try yours, it looks delish! I hope they like this one! Sometimes the homemade ones can be dry or not cheesy enough. I LOVE your blog! I find it super helpful and encouraging! 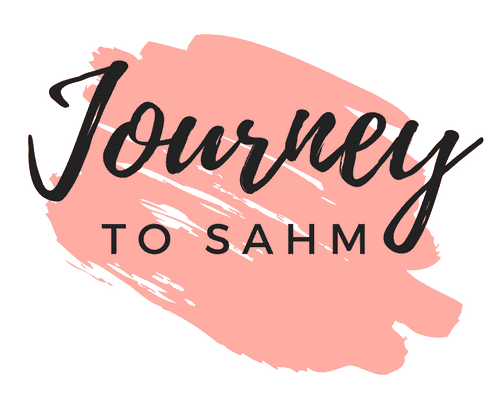 I wanted to let you know that because I love Journey To SAHM so much, I nominated you for the Sunshine Blogger Award! nominating other bloggers and answering a few fun questions.